Photos of the Queen's University Golden Gaels Women's Soccer team at the University of Western Ontario Mustangs at Brescia Field, UWO, London, Ontario on October 29, 2005. In 2005 OUA playoff action, the Gaels defeated the Mustangs 2-1 in an overtime shootout. 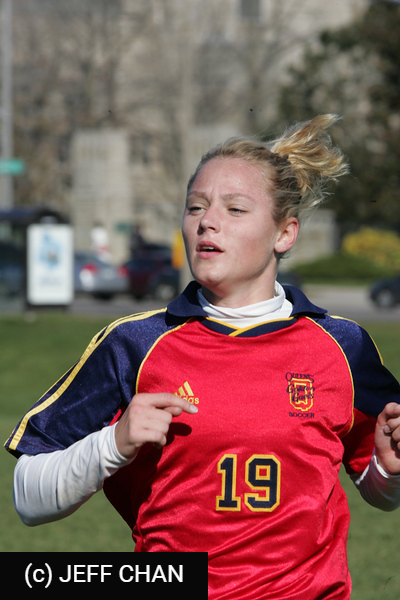 Laura Barker scored for Queen's in the 8th minute and that lead held up until the Mustangs tied it in the 75th minute. After two scoreless OT periods, the Gaels won the shootout 3-1 with Eilish McConville, Janine Clarke and Ali Skinner counting for Queen's. Kate Chambers kept the Gaels in the game as Western had a territorial advantage through much of the regular time and made two key saves in the shootout to preserve the win. All photos are Copyright (c) Jeff Chan 2000-2005, but may be used for personal non-commercial use, or by Queen's University, unless otherwise authorized.